The Large Magellanic Cloud is a satellite galaxy of our own Milky Way located around 160,000 light-years from Earth. 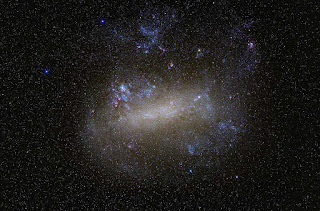 It is the 4th largest in the Local Group following the Andromeda Galaxy (M31), the Milky Way and the Triangulum Galaxy (M33). The light blue area in the upper left central part of the image is the Tarantula Nebula which is the most active star-forming region in the Local Group.